Stylish looks and great bass performance, however, can't completely mask this sound bar's other sonic shortcomings. 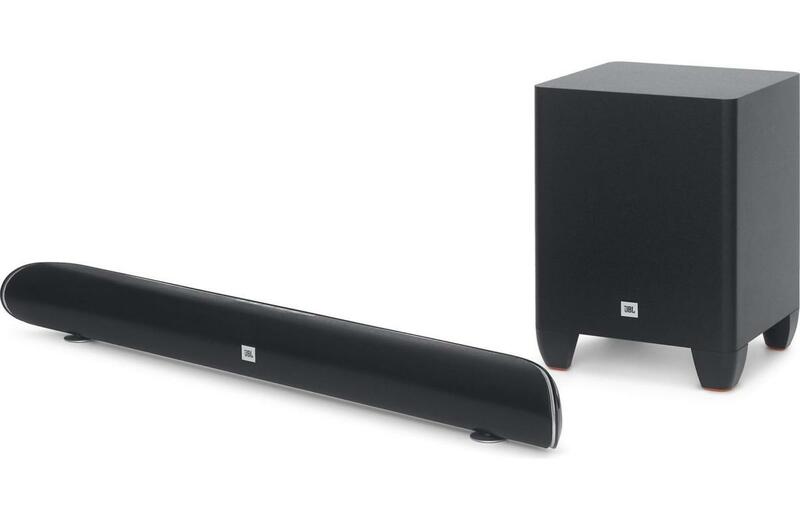 JBL’s Cinma SB 250 is an entry-level soundbar to be sure. But unlike many of its competitors, this kit consists of a soundbar and a wireless subwoofer. 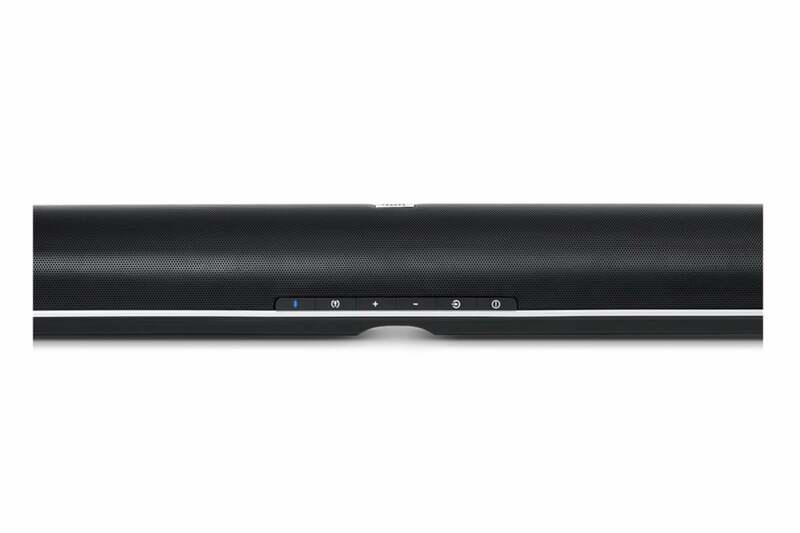 The soundbar handles the midrange and upper frequencies, while the sub carries the load of reproducing deep bass notes. Measuring 32.7 inches wide, 3.1 inches high, and 2.5 inches deep, the Cinema SB 250 will complement any modestly sized HDTV or 4K Ultra HD TV. Its curved and tapered ends make it seem even smaller than it is. You can mount the SB 250 to the wall above or beneath your flat-screen, or you can set it atop a cabinet. JBL provides round rubber feet for the latter scenario, so the speaker doesn’t scratch your furniture. The speaker is rather tall, however, so if you set it in front of your TV, there’s a good chance it will block the TV’s infrared receiver.And at this price point, JBL couldn’t afford to build an IR repeater into the SB 250. If you’ve had disputes with your significant other over the aesthetics of audio equipment and unsightly cables, the SB 250’s small size and wireless connectivity should help. The 6.5-inch subwoofer connects to the main soundbar via Bluetooth, and it can be placed just about anywhere in your room, provided its within 33 feet and in line of sight of the soundbar. The subwoofer is a ported design, with a phase switch on the back that helps the subwoofer blend with the main soundbar based on room placement. Props to JBL for including this important—yet basic—control in their subwoofers (you'll also find it in the larger Cinema SB 450 kit). It’s surprising how few soundbar manufacturers do. So how do you use the phase switch? As a rule of thumb, if you're placing the sub near your soundbar at the front of your room, then you want to keep it in its default position. If you are placing the sub behind your seating position, you want to switch it to the alternate position. On most subwoofers, default is zero degrees and the alternate position is 180 degrees. If you’re not sure which is which, play some bass-heavy material and put the phase position wherever it sounds louder. If there’s no difference in either position, keep it on normal. JBL lists the SB 250’s total system power as 200 watts, but it doesn’t specify how that wattage is split between the amp in the soundbar and the one in the subwoofer. The system’s total frequency response is a respectable 45Hz, which puts the JBL Cinema SB 250 right in line with what you’d get with larger bookshelf speakers. 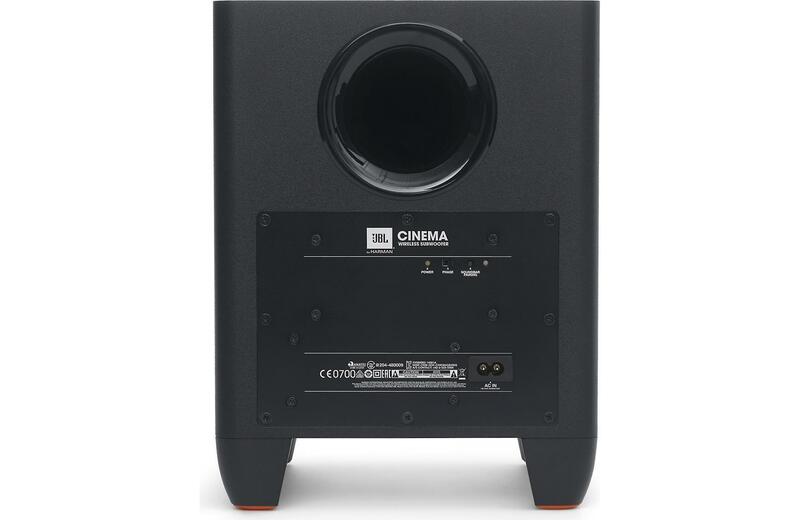 The Cinema SB 250’s subwoofer is a rear-ported design with a phase switch to help tailor the sub’s phase response based on room placement. The subwoofer carries a significant share of the audio load. Don’t ever think you’ll be able to get by with the soundbar alone. When I played the SB 250 without its sub, the speaker sounded thin and anemic. The subwoofer is likely crossed at a higher frequency to the soundbar, so I would recommend keeping the two units relatively close together; otherwise, your brain might begin to localize the sub’s frequencies. Human acoustic perception has trouble identifying where frequencies below 80Hz are coming from. Above that threshold, your brain becomes adept at it, and the separating between the origin point of low and higher frequencies will spoil your listening experience. Soundbars aren’t necessarily difficult to set up, but some consumers find A/V equipment intimidating. Clear and basic instructions typically make non-techies feel better. The Cinema SB 250 fails on that front. The text in the included manual is far too small for older consumers to decipher. JBL should have included a poster-style quick setup guide with large, clear graphics. If you need documentation, I suggest going to JBL’s website and downloading the instructions from there for a better setup experience. 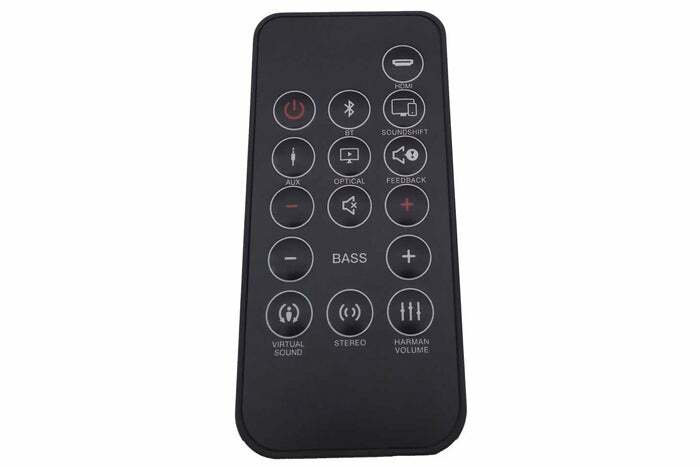 The credit-card-sized remote control that JBL packs in with its Cinema SB 250 soundbar is terrible. I should also note that the JBL’s remote stinks. 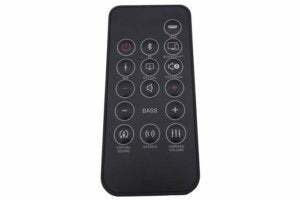 To be fair, most of the soundbar remote controls in this price range will disappoint, but the small credit card-style remote JBL provides with this speaker will get under your skin quickly if you need to use it often. HDMI connectivity—and ARC (Audio Return Channel), which usually comes with it—are the most important features you’ll lose when you buy a soundbar in this price range. 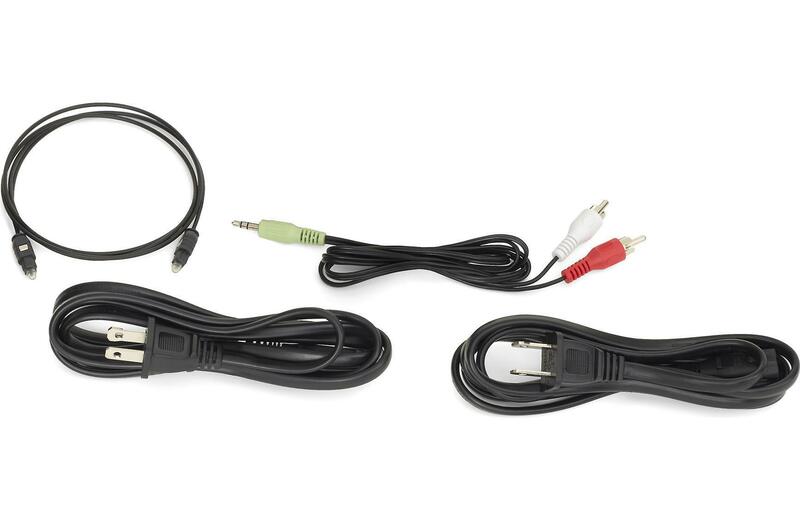 You’ll connect the SB 250 to your TV using either a Toslink cable or RCA analog stereo cables. You won’t get a ton of other features, either, but you’ll appreciate the ones you do get. JBL’s SoundShift technology, for example, lets you automatically switch between your TV’s audio and audio from your smart device. The JBL Cinema SB 250 can also learn any TV-remote’s volume control, and there’s an EQ switch that can calibrates the soundbar for either wall or tabletop placement. The JBL SB 250 inclues a Toslink optical digital cable to connect to your TV and an analog stereo cable. Bass suffers when you play a speaker at low volumes, and dialog can become difficult to hear. A feature JBL calls Harman Volume can compensate for this. To my ear, when Harman Volume is engaged, the soundbar applies aggressive equalization and a significant boost in bass response along the frequencies associated with human voices. This restores low-end impact and enhances vocal intelligibility. Some might find Harman Volume downright euphonic at higher volumes too, but watch out for your ears: The audio boost isn’t subtle—I measured an increase of 8- to 9 decibels. Harman Volume can also level large volume discrepancies, eliminating the jolt from annoyingly loud TV commercials. You can choose low, medium and high settings, with the low setting compressing the signal the most. Which setting works best for you will be a matter of personal preference. Setting up the Cinema SB 250 was relatively painless. The subwoofer is supposed to pair automatically with the main soundbar. The first time I plugged in the sub, it didn’t connect—it was the only sub in our roundup that didn’t pair on first try. Once I unplugged the sub and plugged it back in, it paired flawlessly and I was on my way. Detail view of the JBL Cinema SB 250’s front controls. I set the Cinema SB 250 on a tabletop, confirmed the EQ position, and fired up Rogue One: A Star Wars Story. This speaker immediately puts you on notice that it intends to blow you out of your seat as it strives to create a cinema-like experience. Bass is immediate and noticeable. JBL’s speaker blew Yamaha’s YAS-106 and Samsung’s HW-M450 out of the water. But there’s more to great sound than bass. The SB 250 exhibited compressed dynamics compared to some of the other soundbars I tested. This was most noticeable on scenes with dialog and especially music. When the rebels rescue Jyn Erso from the imperial prison transport, for example, the blasters were robbed of their dynamic range. Turning to music, playing Robert Plant’s and Alison Krauss’ Raising Sand, Krauss’ vocals sounded boxed in and muddy. Is the JBL Cinema SB 250 a fit for you? JBL’s Cinema SB 250 is a sleek-looking soundbar that delivers bass in spades. It has decent dialog enhancement, and it can tame loud TV commercials. If you’re primarily interested in a cinema-like experience with prodigious amounts of bass valued above all else, you’ll love the SB 250. If you’re looking for an entry-level soundbar with superior sound quality overall, you should look elsewhere. The stylish-looking Cinema SB 250’s Spartan features and exceptional bass performance will appeal to the movie-lover on a budget.